« What Can I Give My Cat For Constipation? The practice of scoring pain is almost exclusively a human medicine tool. A doctor or nurse asks a patient to rate the pain he or she is experiencing with a number, for example, 0 to 10, with 0 indicating no pain, and 10 signifying excruciating pain. In veterinary medicine, our canine patients can’t tell us in words how much they’re hurting, so pain scoring must be done primarily through observation. It can be used not only with dogs who’ve had surgery, but also any pet dealing with an injury or illness. Since every animal is an individual with a specific pain threshold, to use pain scoring effectively, we must observe the dog before painkillers are given and before any procedure is attempted, no matter how minor (e.g., a blood draw). We also need to apply some science to the art of observation when determining a dog’s pain score. We need to know average pain levels for the condition the animal has or the surgery about to be performed, and factor those into the equation. This is necessary because many dogs are stoic even when in significant pain. Pain score: 0 No pain present. The patient is happy, acts normally, moves comfortably, has a normal appetite and (if applicable) does not bother the surgery site. TPR (temperature) is normal. Pain score: 1 Mild pain present. This is usually displayed by a slight limp, difficulty getting up or down or a slight increase in TPR. The patient is eating, tail wagging and not depressed. Pain score: 2 Moderate pain present. The patient shows sensitivity and may lick or chew at the surgical site or wound. The patient may refuse to eat and may seem depressed, and has slow, shallow respirations. Pain score: 3 Severe pain present. Signs include depression, reluctance to move and sensitivity at the surgical site or wound. The patient will usually not eat, may vocalize and may lie down but not sleep. Pain score: 4 Excruciating pain present. The patient shows all the signs described with a pain score of 3, in addition to intermittent panting, increased TPR — even at rest — constant vocalizing, profound depression, dilated pupils, aggressiveness and deep breathing. 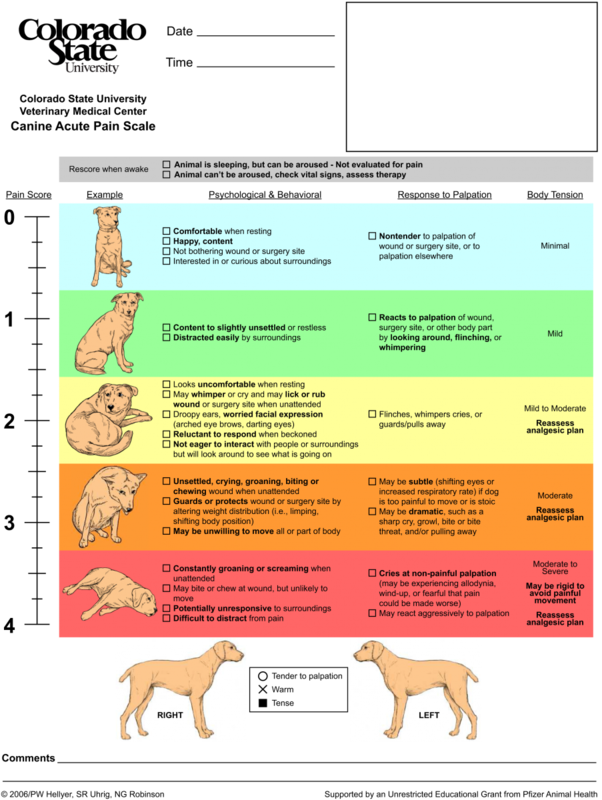 To view the full detailed CSU pain scales, which include rough drawings of how your dog might appear with a pain score of 0, 1, etc. : Canine Pain Scale. There are also some newer therapies I’ve used with good success, including the Assisi Loop, a form of pulsed electromagnetic field therapy. In addition, there are a variety of beneficial supplements you can add to your pet’s diet, again depending on his diagnosis and treatment protocol. Myofascial pain, which is pain in the muscles that results from one or more trigger points, is common in dogs, but because it doesn’t show up on x-rays or other diagnostic tests, it’s often left untreated. The result is that many dogs suffer needlessly with significant, chronic muscle pain. Trigger points, sometimes described as knots in the muscles, are focal points for inflammation and irritation. They may be in an active or latent phase. In the active phase, a trigger point may be very painful for your pet. If pressure is applied, pain may radiate from the trigger point to other areas of your dog’s body, such as down the limbs (this is known as referred pain). He may also have latent trigger points that are sensitive, but not as acutely painful as active trigger points. However, even latent trigger points may lead to problems for your dog, including stiffness and restricted range of motion. There are many situations that can lead to this type of muscle pain. Some of them may occur suddenly, such as an injury from an unexpected wrenching movement, a fall or a blow to a muscle. Often, however, the development of such pain, and its related trigger points, is gradual. Just like in humans, dogs may suffer from muscle pain as a result of overuse or muscle imbalance. For example, if your dog runs along a fence every day or favors a back leg due to arthritis, some muscles are being overused and others underused, leading to muscle imbalance and the development of trigger points. If you suspect your dog is suffering from myofascial pain, see a veterinarian who is experienced at finding trigger points. Once they’ve been located, there are a couple of options for treatment. One, which is fairly invasive, is dry needling. This involves using an acupuncture needle that is pushed through your pet’s skin to stimulate the trigger point. This may release the tight muscle bands associated with the trigger point, leading to decreased pain and improved function. Electro-acupuncture and acupressure may also be helpful for some dogs with myofascial pain. Cold laser therapy and ultrasound therapy may be beneficial for dogs that won’t tolerate acupuncture. Another less invasive option is manual manipulation of trigger points using trigger point massage or trigger point therapy. I have found that recurrent trigger point problems can be a result of an underlying chiropractic issue, so if your pet isn’t getting better, consider getting a chiropractic evaluation.